Urban or suburban, you can live amid the flora and fauna. With neighbors, too. Aberlin Springs and Enright Ridge Urban Ecovillage show the way. Enright Ridge residents reap the harvest of the community's garden, one of many sustainable features of their East Price Hill setup. For those who share a yen to live in harmony with Mother Earth, getting “back to the land” is nothing new. It was all the rage in the ’60s. But the close-to-nature communities of today are a far cry from the patchouli-perfumed communes that presided when Hendrix walked the earth. Exhibit A: Aberlin Springs in beautiful Union Township, Warren County, the region’s first farm-to-table “agri-community.” It’s part of a national trend built around reconnecting to the land and living close to your food sources, with an emphasis on health and wellness. The developer NorthPointe Group, in partnership with Pendragon Homes, is developing Aberlin Springs around a timber-framed community and wellness center (which will offer yoga and massage therapy) and the organic farm from which residents will get fresh produce and meat. Beyond the food are the views: Homes face farmland, with wooded vistas out back. Selling their 141-acre family estate to the highest bidder didn’t sound right to the surviving family members, Leslie Ratliff, president of Pendragon, and her mother Barbara, who still live on the site. They wanted to stay close to the land they love and find a way to keep their homestead’s agrarian character whole. Three years into the project, the 140-home development has commitments from 51 buyers. Prices will range from $300,000 to $1,000,000 with roads set to be laid this fall and construction beginning in spring 2017. While still in the planning phase, the developers are investigating sustainable amenities that include geothermal energy and septic systems. Of this much we can be certain: The future inhabitants of Aberlin Springs will be more connected with nature, the cycles of life, and each other than their suburban counterparts. If the trappings of a homeowner’s association (albeit one that includes a CSA) aren’t your thing but proximity to the land paired with a quick commute downtown appeals to you, consider Enright Ridge Urban Ecovillage, a community centered around the ecological education organization known as Imago. Founded in 2004 by social workers Jim and Eileen Schenk, it’s based on the belief that human beings have come to mistake money for happiness, when in reality what really keeps the blues at bay are healthy relationships with one other, the environment, and our planet. Not all residents are active in the Ecovillage, Schenk says, and that’s OK. 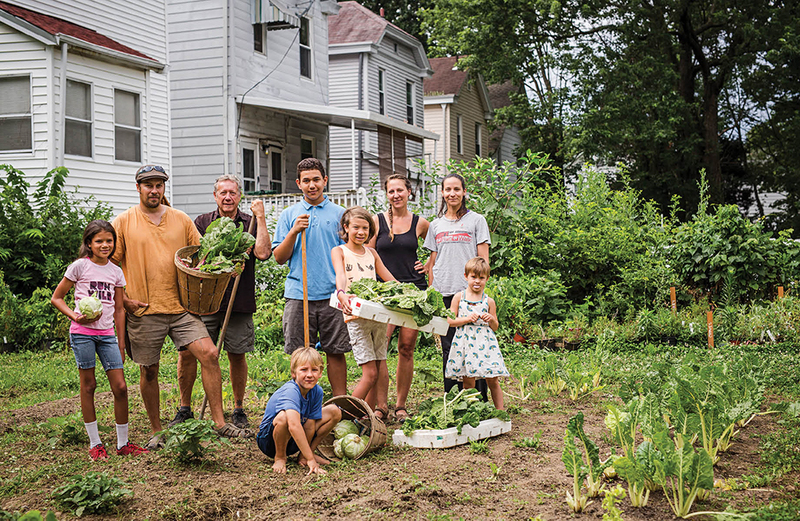 Despite the verdant acreage swaddling the Ecovillage’s four streets—Enright, Terry, McPherson, and most recently Wells, all off of West Eighth Street in East Price Hill—the community’s 102 buildings and 119 households embrace urbanity. Renewing the urban core is a big part of their mission, as sprawl is detrimental to the environment. Despite the difficulties in renovating and sustainably retrofitting old buildings, the community pools funds to buy up and rehab homes. So far, they’ve saved 17 from foreclosure. The south sides of certain houses sport solariums and photovoltaic arrays. Residents capture rainwater, recycle, compost, keep chickens, and garden—all while supporting one another in sustainable living. A CSA is also at the center of this urban experiment in environmentally cooperative living. With help from an investor, the community bought a derelict greenhouse, where they start crops early in order to get three seasons of produce each year. The Enright CSA produces about 50 shares of fresh produce—each enough for a household of two or three people—for a cost of $600 or an annual work commitment. More recently, Enright Ridge Urban Ecovillage bought the Paradise Lounge at the corner of Enright and Eighth, and will turn it into Common Roots, an urban homesteading store and pub.